Last year set a record for the Cayuga Economic Development Agency (CEDA). As the Business Development Specialist, one of my roles is to assist entrepreneurs in starting up new businesses through mentoring and making connections to available resources. In 2017, over 115 individuals received assistance for starting their own businesses in Cayuga County. This is almost three times the annual goal. Of those 115, over 25 businesses opened or were close to opening by the end of 2017. For those who chose not to start, we still consider it a success – there likely was a good reason. This increased number could either be an indication that the confidence in our economy has increased, or that our Marketing Coordinator is doing a fantastic job of getting the word out about CEDA’s free and confidential business assistance! I believe it’s a mix of the two. Initially, Gretchen found her way to the Syracuse SCORE Chapter. There she attended the Five “Simple Steps for Starting a Business” workshop. At the end of the course, the participants had the option of being paired with mentors for further counseling and she was introduced to me, a mentor with the Auburn chapter of SCORE. Our first meeting covered the services offered at 2 State Street, startup basics, and other locally available resources. In follow-on meetings, we focused on her financials: recording her income and expenses, creating a budget, and analyzing her data. As a result, she discovered she needed to make a few adjustments to ensure her sustainability. 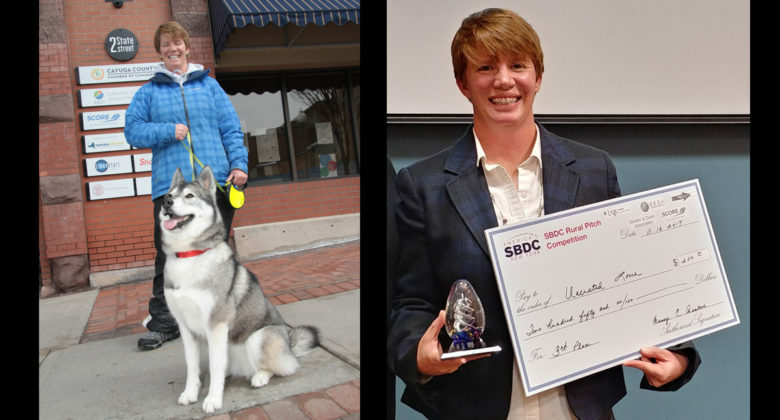 In the Fall of 2017, following the Auburn SCORE’s Simple Steps to Starting a Business (SSSB) workshop series, the Small Business Development Center (SBDC) at OCC hosted a Rural Pitch Competition, and Gretchen applied. Along with 6 other participants, she attended 4 weeks of classes, concluding with a “pitch” to local business owners and professional service providers. The top 3 participants were awarded cash prizes to further grow their businesses. Gretchen was a proud winner of one of those cash prizes! I quickly realized Uncrated Love would be a good project for the students in the Cayuga-Onondaga BOCES Graphic Design and New Media program. Each year, I refer about half a dozen entrepreneurs to BOCES to have a logo designed for their businesses. It’s a win-win situation: the entrepreneur gets a free (and very good) logo; the students get the experience of a real-world client situation and have the potential to see their artwork used by a business in our community! Gretchen has received numerous compliments about how well animals respond to her. Today, she is busier than ever and thoroughly enjoys the job she created for herself. Soon enough, she’ll be looking into SCORE’s workshop, “Hiring Your First Employee!” Follow SCORE Auburn’s Facebook page to stay informed about upcoming events, including SSSB workshops followed by another round of the Rural Pitch competition, beginning this September. I certainly have not achieved these goals on my own. CEDA collaborates with several local and regional partners to provide the resources necessary for small businesses to succeed. With CEDA’s close relationship with the Auburn SCORE Chapter, we are connected to the Small Business Administration (SBA) and other resource partners: Small Business Development Centers (SBDC) and Women’s Business Centers. Other services that we regularly refer people to include local accountants, corporate attorneys, financial institutions, insurance providers, and marketing/advertising/graphic design/website firms. If you have a dream of owning your own business and need help figuring out the right path to take, contact us to schedule a free and confidential meeting with me or with another certified SCORE mentor. No dream is too big or too small. If we have assisted any other entrepreneurs who would like to share their success stories, please contact Devon Roblee, our Marketing Coordinator, to be included on CEDA’s website! Maureen Riester is a SCORE mentor and the Cayuga Economic Development Agency’s Business Development Specialist, focusing on bringing new business to Auburn and Cayuga County. She can be contacted at (315) 252-3500 or mriester@cayugaeda.org. Published in the March 15, 2018, edition of The Citizen.